The past couple of weeks I’ve been resting up and recovering from my hospital stay. You would not believe the parade of kindness that has been rolling through my front door. Seriously, people have been so good to me and my family. We’ve enjoyed fabulous dinners, beautiful flowers (please note the picture above and below), thick shakes from Iceberg, treats, goodies…and great conversation with friends. Did I mention it was a really great parade? I’ve loved the wonderful meals people have brought in. Not just because they tasted so darn good, but because many of them were recipes I’ve never tried (or even heard of!) And so, I have a lot of great new ideas to share with you. A win win, wouldn’t you say? Guess I better hit the hospital on a regular basis. Which was a joke, just to clarify. Today I have my May Menu Plan for you. As a side note, I’m only going to be making a few of these recipes this month, while I ease on into to being 100% useful again. But I thought you would enjoy seeing a months worth of ideas, so I went ahead and made a nice full list for you. 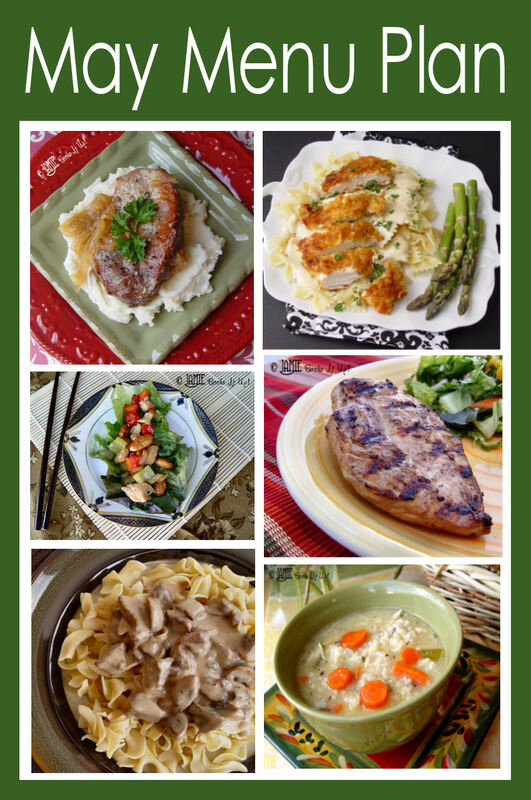 As usual, colored titles are links to recipes previously posted on the site. Black titles are recipes that I am working on and hoping to post in the future. How do you get the recipes for the “NEW”dinners?